29 out of the 30 companies on BSE 30 displayed negative growth in share price during September to October 11th. Only Wipro showed a growth in share price that too of 0.11 per cent. Sensex has taken a massive hit with over Rs 20 lakh crore in market cap getting wiped out since September 2018. Total equity market capitalisation of BSE in the beginning of September stood at over Rs 158 lakh crore, which fell by almost Rs 20 lakh crores, or over 13 per cent, in a span of 28 sessions. The market cap of BSE Sensex stood at over Rs 138 lakh crore as on October 10 as per the latest information available on BSE. Today's market crash of 1,000 points would increase this gap even more. 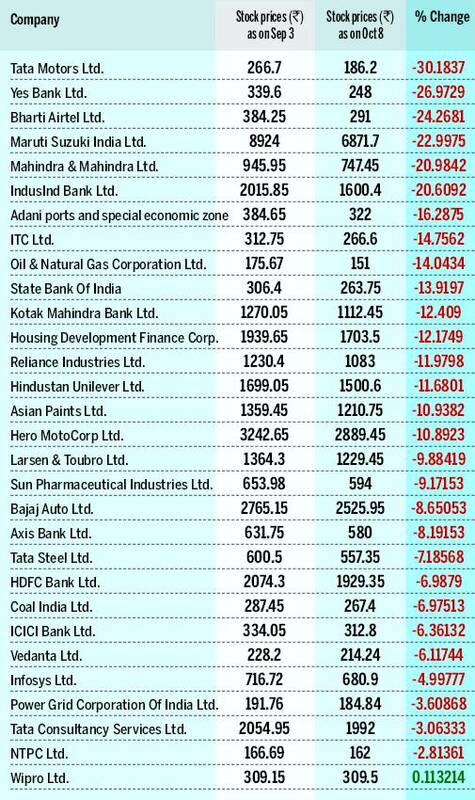 29 out of the 30 companies on BSE 30 displayed negative growth in share price during the period. Just Wipro showed a growth in share price. Wipro grew by 0.11 per cent. Tata Motors, Yes bank, Bharti Airtel, Maruti Suzuki, Mahindra and Mahindra and IndusInd Bank were the top losers posting a decline of more than 20 per cent on Sensex. These companies saw a decline of 30.18 per cent, 26.97 per cent, 24.26 per cent, 22.99 per cent, 20.98 per cent and 20.60 per cent in their share price, respectively. 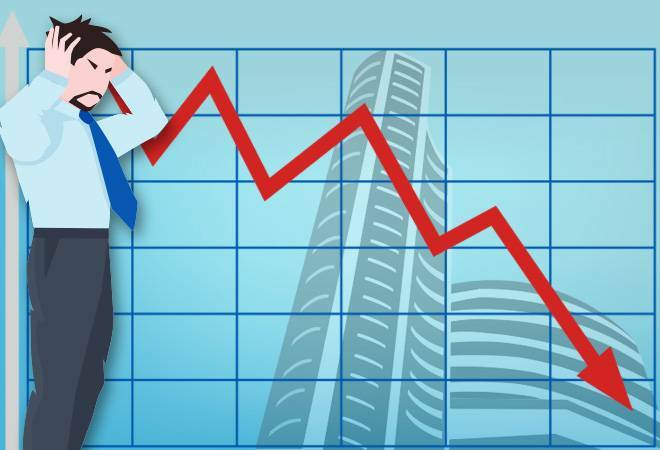 Other companies that lost more than 10 per cent of their share price include Adani ports (-16.28 per cent), ITC (-14.75 per cent), ONGC (-14.04 per cent), SBI (-13.91 per cent), Kotak Mahindra bank (-12.40 per cent), HDFC (-12.17 per cent), Reliance Industries (-11.97 per cent), Hindustan Unilever (-11.68 per cent), Asian Paints (-10.93 per cent) and Hero Motocorp (-10.89 per cent). The downward movement of domestic stock markets can be attributed to falling rupee, rising crude oil prices, higher US yields and Foreign Institutionl Investors (FII) sell-off. Brent crude oil prices have seen an appreciation of 8.20 per cent since September while Indian rupee has seen a depreciation of 4.90 per cent in the same time frame. Since September 28, FIIs have been in a constant selling mode. On September 28, they sold Rs 1,699.94 crore stake in the Indian capital market. And in October till date, they sold Rs 18,729.60 crore worth stake in capital markets. The sale in mere seven trading sessions this month is mammoth when compared to Rs 21,034.54 crore sell off in September. Are government and RBI finally seeing eye to eye on the economy?